The Ford Focus RS Mk3 will go on sale in the first half of 2016 here in Australia. There are few minor differences between the American and European models. This is due to mainly legislation issues rather than tuning for the two environments. The more changes between the models the more cost is involved. 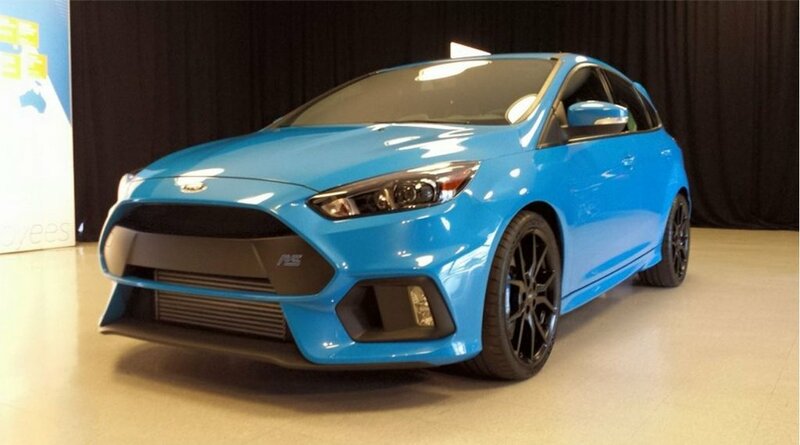 The Ford engineers have confirmed that the new Focus RS will have at least 257kW of power and 440Nm of torque, 24kW and 8Nm more than the Mustang using the same power plant. This is achieved by fitting a more free-flowing twin-scroll turbo, a bigger intercooler and a larger-bore exhaust. The four cylinder 2.3lt turbo Eco boost engines cylinder head has been manufactured from a higher strength alloy which is able to handle the higher operating temperatures. Also included is the biggest radiator to be fitted to the current Focus models. With all of this it is not the neatest looking engine bay. The engine will be coupled to a six- speed manual gear box with a short shift mechanism. The RS will have launch control which can be performed as many times as you wish, but always think of the clutch. The RS power is transferred to the rear end via a tail- shaft from the front Transaxle, with no central differential. The rear differential has two clutches one on either half shaft. This enables the 70% of the engine output to be sent to the rear wheels, with 100% of that power being able to be transferred to either rear wheels.The brake based torque vectoring system is used rather than a mechanical limited slip diff. Another feature of the new Focus RS is “Drift Mode” credited to Ken Block. What drift mode actually does is loosen up the stability control and the dampers so allowing the rear end to transfer more weight side to side in a corner, which can make the car oversteer. The chassis is to the usual RS stiffness allowing the RS to handle even better. Michelin Pilot Super Sports tyres fitted to 19” forged aluminium rims, in two styles, with black rims being an option, ( UK/Europe). The Brembo four piston front calipers and one piston rear calipers are standard equipment. Seating will be in two different styles, the standard Recaro seats, stitched in blue with the RS Recaro livery, in a ST style seat. Both styles of seats will have black partial-leather bolsters. The shell bucket style seats will be an option for the UK and European markets. Ford thinks the Focus ST style seat may be more appealing as the Focus RS is a four door, which may make it easier to elite from the vehicle, giving the smaller front doors, but still retaining that sporty look and feel. The colours that will be available will be Shadow Black, Frozen White, Nitrous Blue and Stealth Grey. As you will see from the photographs there are shots of the American model in Nitrous Blue, as with the Frozen White and Stealth Grey models shown all three are sporting the ST style seats and you will notice the single mid-mounted low LED fog light is deleted on the American model. The Blue coloured brake calipers are to be an option, (UK/Europe). The Focus RS still sports the three gauge pod on top of the dash and press button start. The automatic engine Stop/Start is optional, (UK/Europe). Australia and New Zealand are both ear marked for the European styled model. If it is anything like the Focus RS Mk2 that Ford Australia sold back in 2010. It will be fully optioned, minus, Navigation with rear camera, Front RS Recaro shell bucket seats, 19” Black forged wheels, Power tilt/slide sunroof and blue painted branded brake disk calipers. The interesting thing is that it will be the first time that there will be four configuration of the dash-board for LHD and RHD vehicles for the world market. With a speedo reading up to 300km/h or 186mph and a red line from 6500rpm to 8000rpm, it is said to be able to reach the national speed limit at least five seconds faster than the previous Focus RS Mk2. The pricing will be competitive with similar vehicles in this class. The talk is somewhere in the ball-park of $50,000 to $60,000. More details to come as more details are released by Ford.